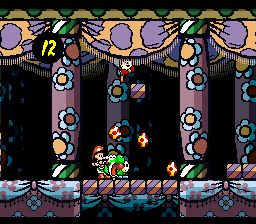 SNES Super Mario World 2: Yoshi's Island (USA v1.0) "warp glitch" in 06:08.02 by NxCy. The author abuses a glitch that lets him warp to any stage up to 6-8. This is an improvement of 3.41 seconds over the previous movie. Most of the improvement comes from breaking Yoshi's movement speed limit, as well as improved Bowser fights. There is also a run without the warp glitch and 100% run.